Put the flour, cocoa, sugar, and salt in a food processor and blend briefly. Add the butter in four or five pieces, and blend until the butter is broken apart into tiny fragments. Then add the water and blend one more time. Pat the dough into the bottom of a buttered, 9 inch round cake pan and bake at 350 degrees for about 10 minutes, until the crust is baked through. Mix the sugar, cornstarch, and salt in a pan, then add the lemon juice, egg yolks, and butter. (Set the egg whites aside for use in the meringue.) Slowly pour in the boiling water, stirring constantly. Cook over medium-high heat until the filling boils and thickens, stirring and turning down the heat as necessary so the filling doesn't burn or stick. 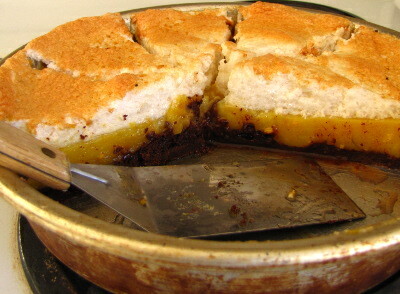 Remove from the stove after 1 minute of boiling and add the lemon peel, then pour into the baked pie crust. Beat egg whites until thye are stiff but not dry, then carefully stir in the sugar and vanilla. Spoon the meringue over the top of the hot pie filling, making sure that the meringue comes in contact with the cake pan all the way around. Then bake at 350 degrees for 10 to 15 minutes, until the top is brown. Let your completed pie cool in the fridge overnight before eating. I never jump through the hoops to keep my meringue from weeping and deflating, but the pie still disappears far too quickly. 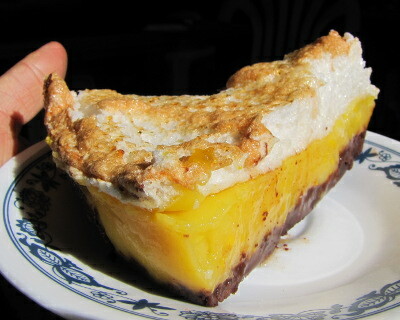 Good thing we could make four more pies just like this from 2011's dwarf Meyer lemon harvest! Clean water from our chicken waterer means healthy pullets and lots of eggs. Hi Anna-- was looking at the pics of your delicious pie, and wondered if you happen to use a hot/wet knife to cut it or if you do something else? I learned to make amazing, smooth cuts into meringue when I was a waitress a hundred years ago--even before ol' Martha Stewart was doing it, by using a hot, wet blade to cut and wiping off anything that sticks along the way. Will try your recipe this month and report back! Great tip! Actually, we just saw our way through --- there's little need for optimal presentation with this pie in our house. But I'll have to keep the hot, wet knife trick in mind for serving company.